Year Of No Light formed in 2001 in Bordeaux (Fr). 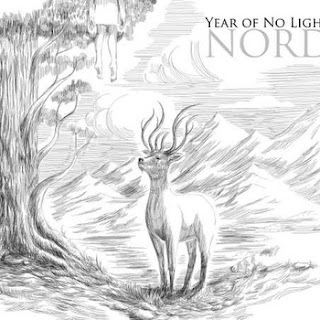 With their first album, Nord, YONL have proven adept a shifting seamlessly between genres, balancing post-rock, sludge, somber psychedelics and crushing dark shoegaze. In 2010, now backed by two drums, 3 guitars, the band released its second album, Ausserwelt, oscillating between drone, doom, post-rock, black metal and progressive music. To celebrate our tenth birthday, here's the reissue of our first album "Nord", initially released in 2006 on Radar Swarm/Crucial Blast with a bonus CD compiling rare tracks from split records (with ROSETTA and KARYSUN among others), some covers (JOY DIVISION and THE CURE) and old remastered songs from our demo. This reissue really worths to collect all tracks from our first line-up (before our instrumental era begun with "Ausserwelt") with agressive songs and screaming vocals. Six years after its first release, this record is still actual with its post-metal style mixed with a lot of other tunes (sludge, drone, black-metal, etc).